In order to do well on the SAT Chemistry Subject Test, you'll need to know a few things about acids and bases, including what they are, how they behave in water, and how they react with each other. Sometimes water molecules split apart to form H+ (a hydrogen ion) and OH− (a hydroxide ion). An acid is anything that increases the H+ concentration of the solution; a base is anything that increases the OH− concentration. How, why, and the degree to which this happens will be the focus of this chapter. This might surprise you, but a glass of water is not entirely composed of molecules of H2O. Small amounts of H+(aq) and OH−(aq) are also present; these are formed during the spontaneous dissociation of water, a process called autoionization. Autoionization is reversible, and an equilibrium exists in which [H+], [OH−], and [H2O] are stable. This equilibrium can be upset by the addition of compounds that alter [H+] or [OH−], as predicted by Le Chatelier's principle. In fact, you'll see that aqueous acid-base chemistry is nothing new; it is simply the study of how other compounds introduced into solution can disturb the autoionization equilibrium of water. Furthermore, at constant temperature, regardless of whether more [H+] or more [OH−] is added to the solution, the Kw, or [H+] × [OH−], of any aqueous solution is equal to 10−14 M2 at 25°C. That's because the only way to change the value of an equilibrium constant is to change the temperature of the solution. Notice that we don't include units here, so after taking the –log, the resulting number has no units. Ask yourself, “What's the exponent of 104 when it's written as 10? Well, it's already written as 10, so the answer is 4. The answers are −8, 3, −2, and 0, respectively. Well, for this test, you can just make a good guess: 58 is between 10 and 100. Since log 10 = 1 and log 100 = 2, log 58 must be between 1 and 2. And that's good enough for the SAT Chemistry Subject Test. Over the years, several different definitions for acids and bases have been introduced. Acids produce H+ in aqueous solution. Bases produce OH− in aqueous solution. Acids are electron pair acceptors in solution. Bases are electron pair donors in solution. Acids are proton donors; bases are proton acceptors. The Bronsted-Lowry definition is the one that's most widely used today, although it is commonplace for chemists to flip between the Bronsted-Lowry and Arrhenius definitions. The most important thing to remember about the Bronsted-Lowry definition of acids and bases is that acids are proton donors and bases are proton acceptors. The term proton is used to mean H+(aq), and H+(aq) reacts with water to form the hydrodium ion, H3O+(aq). Most compounds behave either just as acids or just as bases no matter what other chemical species are in solution. However, a handful of molecules/ions can act as either acids or bases. They elect to either donate or accept H+(aq) in response to whatever else is in solution; these are calledamphoteric molecules/ions. One example of an amphoteric ion is the bicarbonate ion, HCO3−(aq). Acids and bases that dissociate completely and stay dissociated are referred to as strong acids and bases. The term strong is NOT used as a common adjective in acid-base chemistry; it has a very specific meaning. It means completely dissociating. For example, HCl is a strong acid, and NaOH is a strong base. Group 1 hydroxides such as LiOH, NaOH, KOH, etc. We've said that strong acids and bases completely dissociate. This means that, for strong acids, [H+] equals the [STRONG ACID], and for strong bases, [OH−] equals the [STRONG BASE]. What is the pH of 1.0 M HNO3(aq)? First, write the balanced chemical equation. It's a good idea to remember that for a 1.0 M solution of any strong acid, pH = 0 because these solutions are commonly used in the SAT Chemistry laboratory questions. Don't make the mistake of thinking that –log(1) = 1! What is the pH of 1.0 M KOH(aq)? Third, take the pOH since that's what we have. Fourth, recall that pH + pOH = 14 (at 25°C), and solve for pH. It is also a good idea to remember that for 1.0 M strong base, pH = 14 because these solutions are also commonly used in the SAT Chemistry Test laboratory questions. Acids and bases that partially, reversibly dissociate are referred to as weak acids or bases. Again, the term weak is NOT used as a common adjective in acid-base chemistry. It has a very specific meaning; it means partial or reversible dissociation. For example, HF is a weak acid, and NH3 is a weak base. The reversible double-reaction arrow is used in weak acid-base dissociation reactions. Being able to identify weak acids and bases will really help you on test day. No one memorizes the list of weak acids and weak bases because there are tens of thousands of them. The way to identify a weak acid or weak base is first to recognize whether a compound is acidic or basic, and then know that if it isn't in the set of the strong acids or strong bases, it must be weak. Weak acids and bases partially, reversibly dissociate. For this reaction, a dissociation constant, Ka for acids and Kb for bases, must be used to calculate the pH of a solution of weak acid or base. Given that KaHF = 7 × 10−4, what is the pH of 1.5 M HF(aq)? Second, write the equilibrium expression, so we can use KaHF . Third, write the algebraic expression (plug in numbers where you have them, and plug in letters where you don't). Fourth, solve the algebraic expression. Fifth, don't worry about the fractional exponent because it will disappear when you calculate pH. Try another example to make sure you've got it. 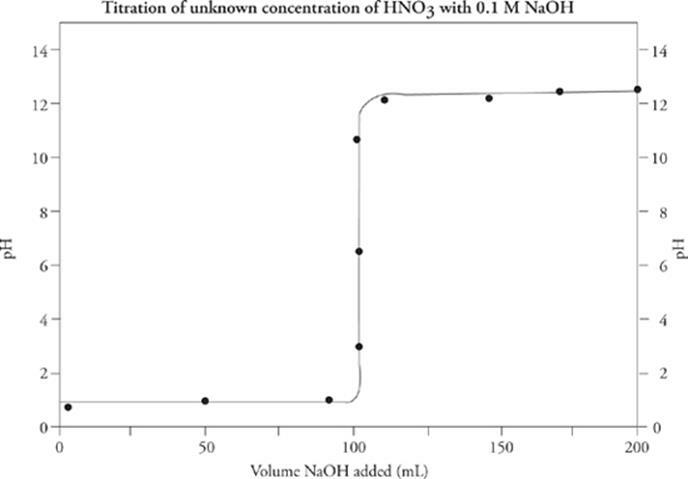 Given that Kb(NH3) = 1.8 × 10−5, what is the pH of 0.5 M NH3(aq)? Second, write the equilibrium expression (use Kb(NH3)). Fifth, don't worry about the fractional exponent because it will disappear when you calculate pOH. Sixth, remember that pH + pOH = 14 (at 25°C), and solve for pH. A conjugate pair of molecules refers to two molecules that have identical molecular formulas except that one of them has an additional H+. Since all of these differ by more than 1 H+, they do NOT qualify as conjugate pairs. Now, the member of a conjugate pair that has an extra H+ is called the conjugate acid, and the member that has one fewer H+ is the conjugate base. A word of caution: Just because a molecule is called conjugate acid or base does not mean it's actually acidic or basic in solution. we see that by definition, hydroxide is the conjugate acid of the pair, but of course, OH− is actually a base in solution. The sum of the pKa and pKb of a conjugate pair of a weak acid and weak base must always be equal to 14 at 25°C. If the acid-base properties of one member of a conjugate pair are already known, then the acid-base properties of the other can be inferred using the conjugate rules. There are four conjugate rules that cover all of the possible combinations of strong/weak acids/bases. 1. The conjugate acid of a strong base is neutral. Example: Na+ (the conjugate acid of NaOH) is neutral. 2. The conjugate base of a strong acid is neutral. Example: Cl− (the conjugate base of HCl) is neutral. 3. The conjugate acid of a weak base is an acid. Example: NH4+ (the conjugate acid of NH3) is acidic. 4. The conjugate base of a weak acid is a base. Example: F− (the conjugate base of HF) is basic. Memorize these conjugate rules. You'll need to know them in order to make sense of acid-base titration experiments. Buffers are solutions used to minimize (not prevent) a change in pH when an additional acid or base is introduced into solution. Buffers are made out of conjugate weak acids and bases—;the acid/base pair must be conjugates because if they weren't, they would immediately react, neutralize one another, and fail to establish a reversible reaction. Therefore, a buffer consists of a conjugate pair of a weak acid and weak base. Unfortunately, people often remember this equation incorrectly, either because they're used to taking –logs in acid-base chemistry or because they're confused about whether [A−] or [HA] is in the numerator. So here is a test to check to make sure that the Henderson-Hasselbalch equation you jot down on test day is correct. Adding a base to any solution, whether it is buffered or not, always increases the pH. The difference between a buffered and a normal solution is the size of the pH change. If we increase [A−] in our Henderson-Hasselbalch equation, then pH ought to increase. Increasing [A−] makes the fraction bigger. 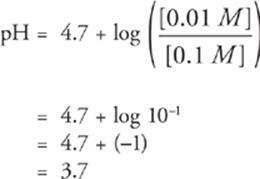 Increasing a number also increases that number's logarithm, so + log is also bigger, and the pH has increased. We can see then that this is the correct equation. Adding a base increases the pH. Of course, the Henderson-Hasselbalch equation can be worked out for pOH, as illustrated below. This passes the above test because increasing the amount of acid [HA] should always increase the pOH of any solution. Given the Ka(Acetic acid) = 1.8 × 10–5, what is the pH of a solution of 0.1 M acetic acid and 0.01 M sodium acetate? First, write the balanced chemical equation that establishes the equilibrium. Of course, Na+ is ignored because the conjugate rules tell us that it doesn't affect pH in any way. Third, covert the Ka to pKa, and write the algebraic expression. Here's another look at the Henderson-Hasselbalch equation, but this time the concentration terms, M, are expanded into the equivalent (moles/V). Examining this version of the Henderson-Hasselbalch equation reveals some additional properties of buffers. 1. If you're given the number of moles of HA and A− in the test question, don't waste time converting to molarity just to plug into the Henderson-Hasselbalch equation; just use moles. 2. If the number of moles of HA and A− are equal, then the Henderson-Hasselbalch equation can be simplified to pH = pKa (or pOH = pKb). 3. The pH of a buffer solution doesn't change with changing volume, since volume does not appear in the equation. Therefore, diluting or concentrating (through evaporation or osmosis) a buffer will not change its pH. The third point is arguably the most important chemical property of a buffer, so memorize it. Diluting or concentrating a buffered solution does not change its pH. All titration experiments are carried out in the same way. The procedure consists of adding a strong acid or base of known identity and concentration, called the titrant, to the unknown acid or base solution. The titrant is carefully added step-wise, and changes in pH are monitored and recorded. With each small sample of titrant, a fraction of the unknown base or acid molecules is neutralized and converted into their conjugates. This procedure continues until either the pH of the solution starts to level off or a color change is observed using a pH indicator. Analyzing a titration curve—;a curve obtained by plotting pH as a function of the volume of added titrant—;provides information about the unknown solution's concentration. The most important feature of any titration curve is the equivalence point. This is the point during the titration where just enough titrant (in moles) has been added to completely neutralize the subject acid or base. At the equivalence point, no unreacted titrant or unknown base/acid remains in solution. Keep in mind that conjugate acids and bases need not be neutral (recall the conjugate rules). Therefore, do not make the mistake of automatically associating the equivalence point with pH 7. 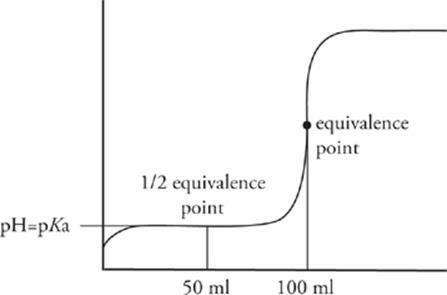 You can locate the equivalence point by eyeballing the titration curve: It is the point at which the curve is the steepest. As we said earlier, the equivalence point is that point in the titration where just enough titrant has been added to completely neutralize the unknown acid or base. Therefore, since the number of moles must be equal at the equivalence point, if we know the concentration of the titrant, and the amount of the titrant we've added, we can calculate the concentration of the unknown solution, using an adaptation of the dilution equation, MiVi = MfVf. The concentration of HNO3 was 0.1 M.
In a titration, the pH at the equivalence point indicates whether the unknown acid or base is strong or weak. If the pH at the equivalence point is exactly 7, then the unknown acid or base is strong. If the pH at the equivalence point is greater or less than 7, the unknown acid or base is weak. This is true because all of the acid/base and added titrant have been neutralized into their conjugates at the equivalence point. Remember the conjugate rules: The conjugates of strong acids and bases are neutral, while the conjugates of weak acids and bases are in fact basic and acidic, respectively. 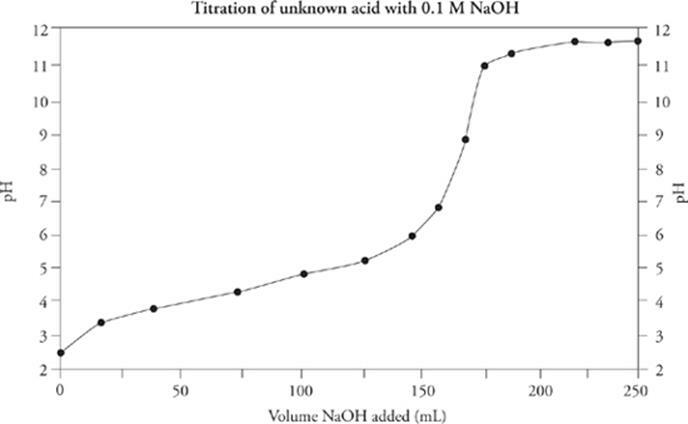 Since the equivalence point for this titration curve lies above pH = 7 (around pH = 9), and the titration was done using an NaOH solution as the titrant, the original solution contained a weak acid. First, a warning: NEVER try to figure out the pKa or pKb of a strong acid or base—;they react completely. Now, figuring out the pKa of a weak unknown acid (or pKb for a weak unknown base) requires finding a second location on the titration curve: the half-equivalence point. The half-equivalence point, as its name suggests, is the point at which enough titrant has been added to neutralize exactly one-half of the original unknown acid or base. You can identify this point by locating the equivalence point and then backtracking halfway to zero along the x-axis. The half-equivalence point is an important location on the titration curve because at this point, equal amounts of the unknown acid or base and its conjugates exist in the solution. That means the solution is a buffer, so the Henderson-Hasselbalch equation applies. For the titration curve we just showed, the unknown weak acid has a pKa = 4.5. Since only a trace amount of an indicator is used in a titration, the acid-base dissociation doesn't impact the solution's overall pH. Instead, the indicator's dissociation equilibrium is shifted one way or another depending upon the solution's pH, according to Le Chatelier's principle. If the indicator above were used in a titration, then in acidic solutions, the indicator would be driven to the conjugate acid form (red), and in basic solutions, it would be driven to the conjugate base form (yellow). All you really need to know for this test is that a chemical acid-base indicator is a substance that changes color in a pH range ±1 of its pKa. For example, thymol blue, which has a pKa = 2, undergoes a red-to-blue color change in the pH range 1 to 3. Also, litmus paper changes color at about pH 7. At pH's lower than 7, the paper is red, while at pH's greater than 7, the paper is blue. Keep these things in mind when selecting an appropriate chemical indicator. Incidentally, the test writers will want you to know how we add acid to base or base to acid, and the answer is to use a buret. A buret is a little measuring device that allows us to drop small, known amounts of liquid into a container. Review this section on acids and bases, and then try the following questions. Answers can be found in Part III. In the reaction above, which species is the conjugate acid? (E) There is no conjugate acid in the above reaction. 53. A titration experiment is conducted in which 15 milliliters of a 0.015 M Ba(OH)2 solution is added to 30 milliliters of an HCl solution of unknown concentration and titration is complete. What is the approximate concentration of the HCl solution? 55. Which is true regarding an aqueous solution of H3PO4 at 25°C? (A) It has a very large acid ionization constant. (B) It has a bitter taste. (C) The concentration of [OH–] > 1.0 × 10–7 M.
(D) It is a weak electrolyte. (E) It can be formed by the reaction of a metal oxide and water. · In any aqueous solution, the product of the H+ and OH− concentrations will equal 1 × 10–14 at 25 degrees Celsius. · An Arrhenius acid is anything that produces H+, and an Arrhenius base is anything that produces OH−. · A Lewis acid accepts a pair of electrons in solution, and a Lewis base donates a pair of electrons. · A Bronsted-Lowry acid is a proton donor, and a Bronsted-Lowry base is a proton acceptor. · Strong acids and strong bases completely and irreversibly dissociate. · To calculate the pH of a strong acid, simply calculate the molarity of the solution. Because every acid molecule produces 1 H+, the molarity equals the H+ concentration, and can be used to find pH. · Weak acids and weak bases partially and reversibly dissociate. where x is the H+ concentration, and M is the molarity of the solution. Solve for x, and then convert to pH. · After one H+ has been removed from an acid molecule, the molecule that remains is the conjugate base. pKa + pKb = 14. · A buffer is a solution of a weak acid/base conjugate pair that resists changes in pH when other acids or bases are added. · In a titration, molarity(acid) × volume(acid) = molarity(base) × volume(base). · The equivalence point in the titration of a strong acid or base is always at a pH of 7. · The equivalence point in a titration is above 7 for a weak acid and below 7 for a weak base. · In the titration of a weak acid or base, the pH halfway to the equivalence point, or the half-equivalence point, gives the pKa or pKb.